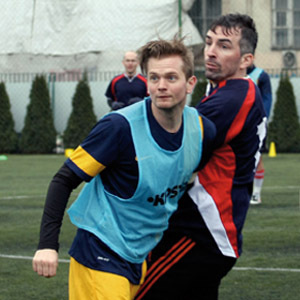 The wind howled and the rain lashed as 10 teams took to the hallowed turf to battle for the Krakow Post Charity World Cup 2014, on March 16. Unseasonably warm weather took a break for the day before St Patrick’s Day, giving way to the more traditional biting wind and drizzle associated with Sunday league football. More than 100 players from a dozen nations were undaunted by the conditions as they warmed up for this epic, six-a-side clash. 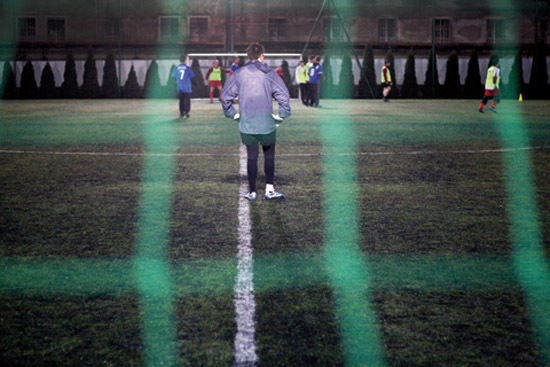 All members of teams that compete in Krakow’s Sunday league, players included medical students from Norway, professors, executives, teachers and the occasional ex-Poland national team name. The charity event, proudly sponsored by the Krakow Post, raised 1,500 zł on the day for lanowa.org and www.hcpt.org.uk – organisation that both provide support for disadvantaged young people. Legendary Krakow pub, the Irish Mbassy, also sponsored the event, as well as fielding two teams – Mbassy FC and the jocularly named Bayern Neverlusen. On the day, the winning team was Kadra GAP (students and staff from the Department of Economics and Public Administration at the University of Economics in Krakow). The plucky runners up were an ad-hoc team assembled for the day, dubbed Kura FC. Although the 2014 cup was the first of it’s kind, the amateur league that occupies the participating teams every Sunday in the season has been running for 12 years. Other teams in the league, and participating in the 2014 Charity Cup, include IFC, Red Army, Copernica FC and Beczka FC . Krakow United’s ‘home ground’ is the pitches in the shadow of Wawel Castle. However, they decamp to Hutnik stadium in Nowa Hutaand – the same ground the England team used for training during the Euro 2012 tournament. The Sunday league schedule is organised by members of each club – of which there are currently seven – who set up 11-aside games, organise referees and so on. The players share the costs of officials’ salaries and other expenses between themselves.